Marchello Racing Team - The Marchello Brothers launch their Car Racing Career!!! Ryan & Reece Marchello kick started their racing career with a bang in Round 1 of the 2010 Independent Race Series at Sydney’s Oran Park Raceway on January 15 and16. The race meeting was a first for the Marchello brothers but sadly a last for Oran Park, which closed it’s gates for good the following week to make way for residential development. 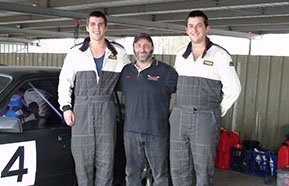 Ryan and Reece attended five private practice days throughout 2009 in preparation for the event, one at Wakefield Park (Goulburn), two at Eastern Creek (Sydney) and 2 at Oran Park (Sydney). Their father and mentor, Terry Marchello, has been teaching the pair everything he knows about car racing and is encouraged to see they are demonstrating plenty of skill and natural ability, and loads of potential. Ryan, competing in a VH Holden Commodore and Reece, in a VB Holden Commodore, which they rebuilt themselves, both found the track to their liking. Ryan and Reece both qualified mid-field against experienced drivers in the HDT Muscle Division. Their 220hp Commodores handled well cornering and under braking, and Ryan and Reece held their ground well, even managing to overtake many cars through the corners, but they found they just could not compete for speed along the straights with the faster cars, racing with approximately 500hp. To make matters worse, Ryan and Reece were competing on practice tyres as their tyre order had been delayed. Their results, nevertheless, were extremely encouraging. Ryan qualified 11th fastest out of 27 cars in the HDT Muscle Division with Reece not far behind in 15th. Ryan maintained his good form in the first race of the Muscle Division, finishing 11th, while Reece having just achieved his personal best time, spun off the track popping two tyres off their rims. While he was not able to finish the race Reece's fastest time during that race was up there with the top contenders. Ryan finished fourth in the HDT Cup feature race, which Reece was forced to watch from the pits. Both drivers rounded out the day with strong finishes, Ryan crossing the line in fourth place in the first of the handicap races and Reece in eighth. Reece turned the tables on his older brother in the fourth and final race of the day to finish seventh, Ryan crossing the line in 15th with very little rubber left on the tyres. Ryan and Reece thoroughly enjoyed the experience and are now planning to upgrade their engines to at least 540hp in a bid to be more competitive. IRS and IPRA will hopefully represent just the beginning for the Marchello Brothers who have their sights set on the V8 Supercars Series. location: MRTeam Home > News > The Marchello Brothers launch their Car Racing Career!! !